Lime green and hot pink flowers spreading out on the pinwheel bow. The base layer is a 2.25" lime green grosgrain ribbon, the front tail is long enough for a first initial to be added on in the color of your choice. 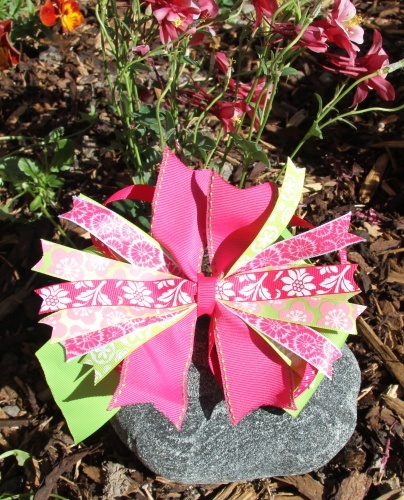 The pinwheel has layers of hot pink with lime green moon stitch ribbons to hot pink and lime green ribbons with white flowers, to white with pink flowers. Your little one's head will be blooming with these flowers. There is white polka dots on hot pink ribbon that are below the pinwheel but on top of the lime green base bow. Pin this pinwheel bow as one of your favorites and get it soon for your sweet little one.